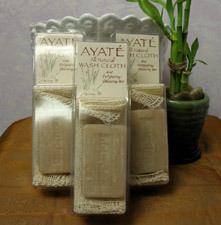 The Ayate Washcloth is a mildew resistant Washcloth, handmade from the natural fibers of the Agave Plant. It comes with a 3.5 oz vegetable glycerin Caribbean Seaweed cleansing bar. 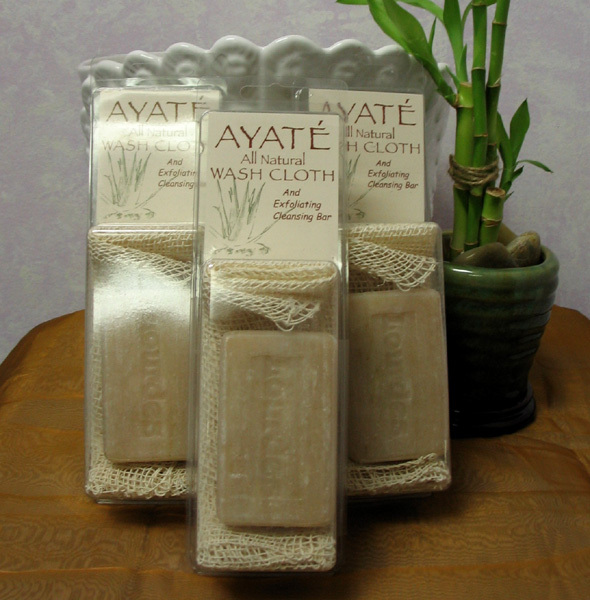 Exfoliate and cleanse your skin naturally! Real Purity skincare and cosmetics, is he purest, and safest cosmetics we have come across!! All of their formulas are derived from certified organic and wild crafted herbs with safe organic earth ingredients. The products do not contain any chemicals, preservatives, petroleum products, or solvents of any type. Not only are they environmentally friendly, but are cruelty free with no animal products or animal testing whatsoever. They offer a full line of products from cosmetics, to hair care, lotions, face creams, deoderants, masks, scrubs, and eye creams. Please give us a call for more information, and for what products we have in stock. Deodorant Stones of America offers all natural body and foot deodorant that is 100% natural, Hypo Allergenic, Talc Free, Non Staining, Non Aerosol, Unscented and with NO Aluminum Chlorhydrate. You can feel good about the effective 24 hour protection their products offer, and no that they are a safe alternative to conventional deodorant products. © The Peacock Shoppe, All rights reserved.